Gaming monitor technology took a significant step forward when Nvidia revealed G-Sync technology last year. Asus is the first monitor manufacturer to roll out G-Sync on a 27in, 2,560x1,440 resolution screen. 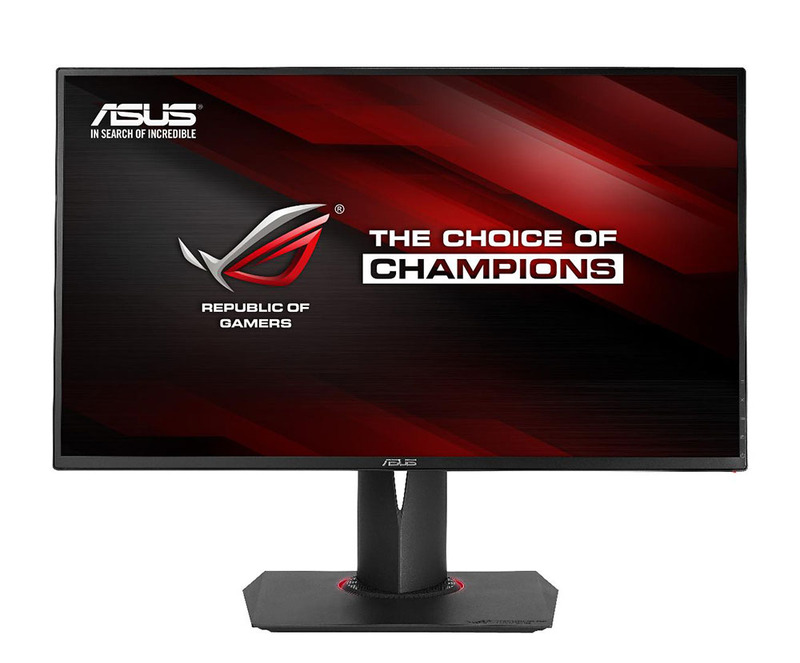 Continuing the firsts, the Swift PG287Q is the first Asus monitor from the gaming-oriented Republic Of Gamers (ROG) range. With upper-midrange graphics cards routinely running at between 30-60fps on this WQHD resolution it makes a lot of sense to incorporate G-Sync technology for smoother gameplay. Put simply, G-Sync matches your graphics card's output to the monitor's - this has historically not been the case for a number of reasons, mostly legacy - leading to smooth visuals in this 30-60fps space. We have written about the technology before, and you can simply head on over to previous editorial to see how it works. It is, in our opinion, one of the best technologies of the last year. Asus is going a step further than most with the PG278Q. Not only is it the first WQHD monitor with G-Sync, but it also supports a 144Hz refresh rate. The benefits of G-Sync are less evident as the refresh rate is increased. Because the screen is being refreshed far more often motion feels smoother when the GPU is able to kick out in excess of 60FPS - the extra framerate is useful in this instance. But the mismatch between graphics card output and monitor refresh rate is still problematic, no matter what the refresh rate, unless you can, quite improbably, guarantee 144FPS from your graphics card. Having a high refresh rate and high GPU performance is preferable, but it's far from a perfect solution. What G-Sync does in this 144Hz-capable monitor scenario is provide powerful GPUs, such as the GeForce GTX 780 Ti and Titan Black, the ability to strut their smooth-looking stuff above 60FPS. G-Sync is great at framerates between 30-60FPS and good at 60FPS+. But there's more to G-Sync than eliminating noisome tearing and stuttering at various framerates. Run at high refresh rates of 85Hz, 100Hz or 120Hz the monitor can use technology called Ultra Low Motion Blur (ULMB), stemming from the LightBoost tech introduced as part of Nvidia's stalled 3D Vision initiative. Specifically, at high refresh rates ULMB modulates the backlight of the monitor such that images are shown for the least time possible, achieved by overdriving the PG278Q when the frame is displayed and shutting off the backlight completely when there's no frame. By strobing the backlight in this manner, allied to high refresh rates, motion blur can be greatly reduced. High refresh rates also mean the Swift PG278Q is certified for 3D Vision, too, though you cannot run both G-Sync and 3D Vision or G-Sync and ULMB at the same time. Obtaining ultra-smooth, low motion blur gaming visuals on a computer monitor is a combination of implementing key technologies engineered by Nvidia; this is exactly what the PG278Q purports to do, to be the best gaming monitor available, so let's hop to it. The PG278Q is pre-assembled out of the box. Simply lift out and place on your desk. Keeping in with modern ROG styling, the monitor is predominately black though there's a LED-backlit, red-ringed section where the stand meets the base. A 6mm bezel frames the 27in monitor whose native 2,560x1,440 resolution is a good fit for the screen size. There's plenty of adjustments on offer so that you can get it exactly in the right place, with up to 0-120mm height, +/- 60° swivel, +20°/-5° tilt and a full pivot to orient it in portrait mode instead of traditional landscape. Build quality is very good. There are no squeaks or rattles as the screen is moved into various positions. Asus' rotating mechanism works very well and keeps the screen fixed in the desired position without much effort. The range of motion is about as good as we've seen from a consumer monitor, and the ringed section at the base is a nice touch. 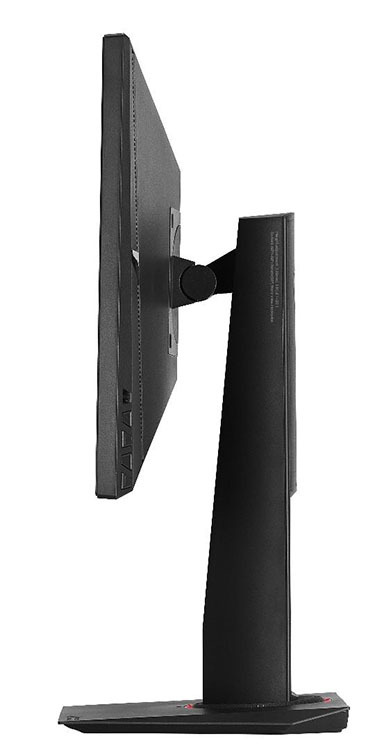 Around the back/side are five easy-reach buttons that control the on-screen display, located directly behind the functions shown on the bottom-right of the bezel. A handy five-way joystick makes it easy to jump through menus and rattle off options. Asus uses one of the buttons as a dedicated 'turbo key' that, at a press, cycles through preset refresh rates of 60Hz, 120Hz and 144Hz, though we wonder why you'd want to indulge in lower refresh rates. ROG-influenced styling extends to the back, with large vents on either side and up and below, presumably to expel heat, along with easy cable management through the base. DisplayPort 1.2 is the solitary connection into the PG278Q. We'd normally lambast a company for having a single connection on a high-end monitor, but it makes sense in this case. As a gaming screen first and foremost, equipped with a 2,560x1,440 resolution, there's little point in using older connections - most modern cards are plumbed out with DisplayPort anyway. Two USB 3.0 inputs sit just above the downstream connection to the PC. There are no speakers on this model, which is understandable as any self-confessed gamer will have their own speaker setup or headphones. An external 90W power brick is included to save monitor-side space. Asus is the first to integrate G-Sync into a monitor of this class. 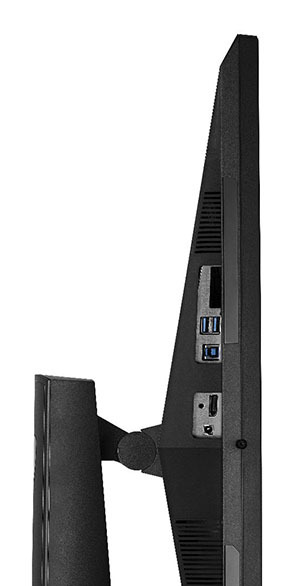 Those 27in, 1440p monitors without the technology typically start at £300 and rise to well over £500. 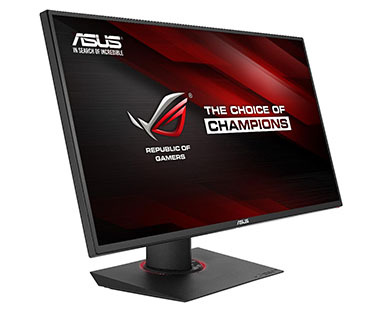 Asus has a recommended retail price of £649 for this model, which sits uncomfortably against the £500 asking price for a new breed of 28in, 4K monitors currently hitting the market. 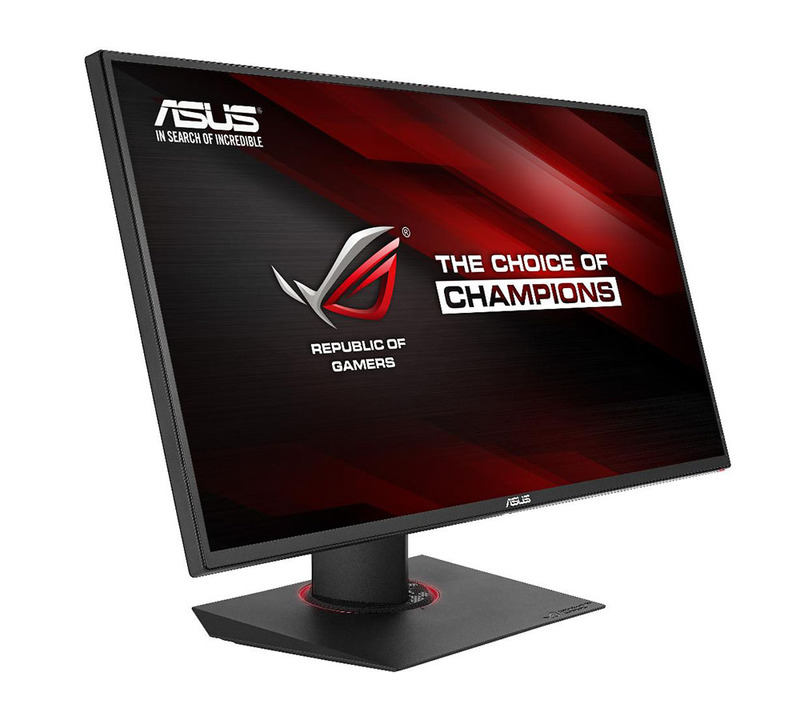 Asus, though, being first to market, claims this to be a monitor wholly geared towards gaming rather than all-round productivity.